Cream shortening (er…margarine), butter and sugar, add eggs, beat well. Sift dry ingredients, add to creamed mixture. Add nuts. Drop from teaspoon about 2 inches apart onto greased cookie sheet. Bake in 350 degree oven 12 to 15 minutes. Makes 5 dozen. Well. Less than that because Terry dropped more like 2 tablespoons…but they made big ol’ flat crsipy thangs that were TASTY. This household loves bread salad, in whatever incarnation happens at whatever day. I prefer the toasted crunchy bread kind over the soaked-in-water stale bread type. In fact, the soaked in water type is, in my opinion, kinda gross…but if you like it, that’s just my opinion, and you are welcome to yours. It’s what’s on the table tonight! Bear in mind it’s a little different every time I make it, depending on the contents of the veg drawer and pantry, but it is always a bowl full of chopped fresh vegs and toasted bread cubes all tossed in a simple garlic oil and vinegar (sometimes red wine, sometimes balsamic) dressing. I’ll put down tonight’s incarnation, with notes at the end. Toss the bread cubes in the olive oil, salt and pepper. Toast on a cookie sheet at 325 degrees for about 15-20 minutes, until they’re dry and showing brown edges. Set aside to cool. Chop all the vegs except the olives and artichoke hearts, make them smallish bits, you want stuff to be about the same size, and throw them into the bowl with the cut up cheese. Mix it together. Finely chop 1/4 cup fresh flat leaf parsley and 6-7 leaves of fresh basil…chop them good and fine. Stir into the vegs. Whisk together until it’s well blended and pour over the vegs. Stir it up good. 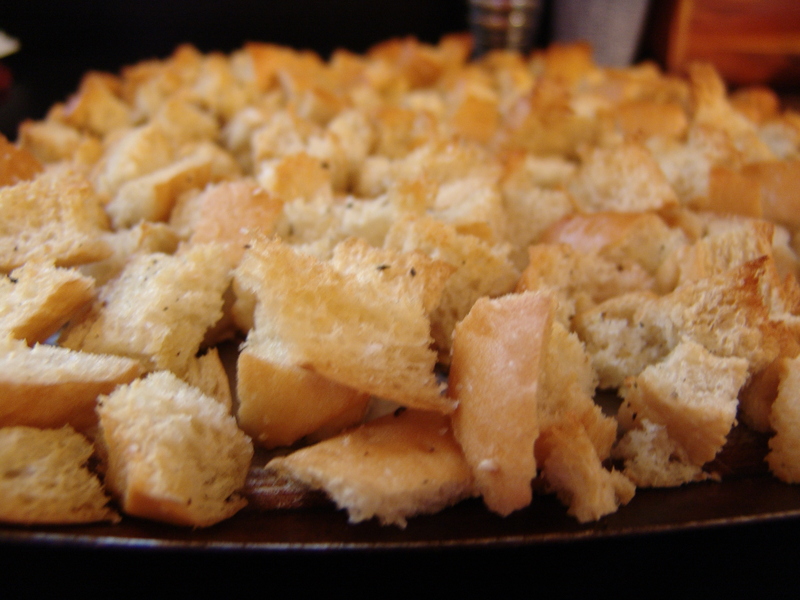 Right before serving, mix in the bread cubes, stir up really well so the bread soaks up a bit of the dressing. Eat immediately, otherwise the bread gets soggy. Terry likes leftovers for lunch the next day, and due to the soggy bread issues, I’ll dip out some of the vegs and pack the bread bits seperately for him to mix up when he’s ready to eat. Any sort of vegs do, if they’re fresh. Avocadoes are excellent in this. So are those baby corn and water chestnuts in the Asian aisle. If you like celery, add that. Use red peppers and well as green. Try simmering shallots in the oil for a different flavor dressing. Or, if you’re feeling lazy, used bottled Italian dressing. Once I made it with rare grilled steak, cut into little bits and barely warmed up. YUM! 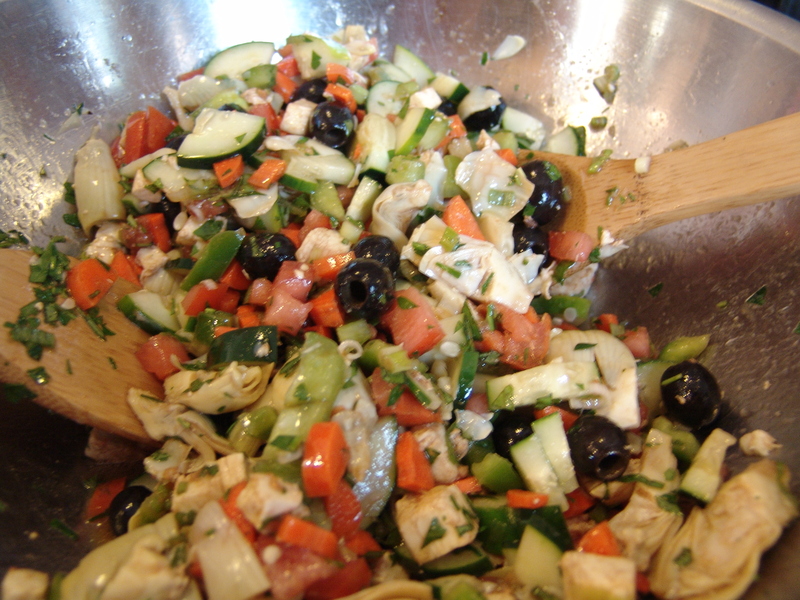 The main thing is to have about 2 parts bread cubes to 1 part vegetables, and a good simple vinagrette dressing. Next time I make the cornbread salad, I’ll share that recipe too. (it’s got a South-of-the-border vibe with roasted corn, jalapenos and cheddar cheese. *garlic oil- a friend’s husband went to Italy last summer and brought back a limoncella bottle that he gave me, knowing my fondness for odd bottles to use for neferious culinary purposes. I found it perfect for garlic oil, because the neck is skinny and the garlic won’t come out when I pour it. So, to make garlic oil (write this down, it’s complicated), Seperate and peel the cloves on an entire head of garlic and stuff them into a bottle with a lid (cork, top, whatever) Fill the bottle with olive oil. Let it sit, giving it a little shake now and then, for a week or so before you use any. Whenever you use it, give the bottle a bit of a swirl first. When the bottle is about 1/2 empty, refill it with more oil, and give it a swirl now and then. You can do this with just about anything that’s aromatic and you want to use to flavor oil. rosemary oil is lovely, or a multi-herb oil with rosemary, thyme and oregano that’s amazing brushed on a steak before you grill it. Oh, throw in a few whole black peppercorns too…tasty! I make out menus Thursday-Wednesday, because I despise buying groceries on Saturday, when everyone else is doing it, and order is necessary. Making menus means the ingredient are on hand, and making them one week at a time means this small kitchen isn’t required to try to hold more stuff than there’s room for. This week involved going through The Notebook. When I find an interesting recipe in a magazine or the Williams-Sonoma catalog, it gets ripped out ad stuck in the notebook. Sometimes it gets printed off the internet and stuck in there. Why not save it on the computer? Because computers are unreliable, and die. And I am unreliable about backing things up to a disc. Ergo, the notebook. Sometimes menus are made from the un-backed up bookmarks on the computer, sometimes the notebook, sometimes the assorted cookbooks, sometimes general-knowledge recipes (like spaghetti or tacos). This week, the notebook. It’s a satisfying task, to sit down with the calendar, the grocery list book and the resources. I’ll flip through until something catches my eye, give it a read-over, and write it down. Meats are rotated. This night will have chicken, the next one pork, another is meatless, whatever. Summer means salads and sandwiches, grilled things. Winter involves soups and stews, Spring means fresh peas and greens from the garden. Anyway, this week…The Notebook. Let me know it you want a recipe and I’ll put it down for you. It’s chicken and rice. It think nearly everyone has a recipe for it. It works for a throw it together meal, or a plan ahead meal, you can cook it in the oven or a crock pot, it’s simple enough on it’s own and there’s myriad things you can do to fancy it up! I’ll give you the basic recipe, and put the fancy-it-ups in parentheses. I make this stuff for church potlucks and there’s rarely any left. Here we go (no pictures, as I forgot to take any while it was being put together). Pour the broth and cream of mushroom soup in a greased casserole or a large crockpot and stir until well mixed. Add the rice and stir a bit more. Put the chicken on top of the rice (it will be covered with the broth mix) and sprinkle the seasonings on top. The broth is salty, so I wouldn’t add any salt to it. People can always salt it to their taste. Bake it at 350 degrees for an hour, covered with foil. Then uncover and bake for about 15 minutes longer. Check to make sure the rice is done and all the liquid is absorbed. OR (and this is how I did it) Put everything in the crockpot in the order above. Cover and set on low to cook for 10-12 hours (overnight) or on high to cook for 6-8 hours. melt the butter in a pot and stir in the flour. Stir over medium heat for 2 or 3 minutes, until the flour *just* starts to brown. Stir in the milk, and stir constantly until it starts to thicken. Stir in the mushrooms and cook for a couple more minutes, then take off the heat, and mix it in with the recipe above. **I love tarragon with chicken, but you can use oregano, basil or dried mixed Italian Blend. You can add sun dried tomatoes in with the rice if you like, and/or garlic, dried onions or sliced green onions. It is essentially a blank palate where seasonings are concerned. You could slide in a Mexican direction by adding corn to the rice and sprinkle something like Mrs. Dash Southwest Chipotle seasoning on top, or an Italian way with Mrs. Dash Italian Medley (can you tell I’m a fan?). This morning I decided Pot Roast was going to happen. I have (had) a nice chuck roast, bone-in so I would be able to make some beef stock later. James Beard recommends lardoons soaked in cognac to stud the roast (that sounds sinful in more ways than one), and I didn’t have lardoons but I did have some peppered smoked bacon ends and that’s kind of like lardoons, right? What goes great with bacon and beef? Onions and garlic. That’s what. And James Beard’s Quick Brown Sauce. (recipe at the bottom of the link). Somehow this time the whole is less than the sum of the parts. It doesn’t smell like it will taste delightful, and anything I eat has to get past my nose. So, in the interest of making it better, I added a half bottle of cheap merlot and a couple of bay leaves. It’s better, but not enough to convince me it will be delicious. In fact, my mind-reading husband called from 30 miles away, right as I was griping out loud about the unsatisfactory aroma odor, to offer a dinner of tacos at the local El Sombrero. He didn’t even know I’d made a disappointing roast, but probably felt the waves of personal disapproval across county lines and came to my culinary rescue. El Sombrero has excellent tacos. They’re cheap and yummy and you get a big basket of hot corn chips and their tasty fresh salsa to boot. brown the bacon pieces in a large skillet over low heat. Brown the pot roast in the rendered bacon fat. Put everything except the wine and bay leaves in a large crock pot set on low, and let cook for several hours. Sniff the odor with disappointment, and add the wine in an attempt to improve things. Add the bay leaves. Put the top back on and grumble. Answer the phone when your husband calls, and cheerfully accept his offer totake you to El Sombrero for tacos and iced tea. Thank your 11 year old when he says the meat smells fine, and offer it to him for lunch the next day, forgetting that he goes to a Christian school and wine soaked victuals might not be the best idea. I hardly ever measure anything. I pour until it looks right, add pinches until it smells right, brown until it’s brown…I never keep track. The only thing I ever actually meausre is when biscuits are being made, and even then it’s kind of not measured. I know about what 3 cups of flour looks like, and how big a spoonful of shortening (or lard…holy crow, lard biscuits are fantastic especially if you use whole fat buttermilk. Yes my arteries clog as I am writing this) and how much buttermilk to pour. So it’s hard to cook something and write the recipe down because I worry that whoever is reading this is the kind of person who needs precision. I have a dear friend who requires precision and for her sake I try very hard but it’s not my way. So bear that in mind when you use a recipe from here. Everything is approximate. Err on the side of caution to start with. If it says 1 tablespoon of something, you might want to start with a teaspoon and add a little bit if you think it needs more. If a biscuit recipe says a cup of buttermilk, it might actually be 3/4 cup or 1-1/2 cups. Start with 3/4 and add more as you need to. I’m telling you…I don’t do precise and it’s why I’ll never write a real cookbook.